Panasonic has confirmed that its long-planned 12-35mm f/2.8 Power OIS 'X' lens will go on sale at the end of next month. Announced as a concept earlier this year, the Lumix G X Vario 12-35mm f/2.8 ASPH Power OIS will cost £999.99 and is due in UK shops at the end of June. Compatible with micro-four-thirds cameras, the 14-lenses-in-9-groups optic should deliver the 35mm viewing angle equivalent of a 24-70mm zoom. An Ultra Extra-Low Dispersion lens aims to minimise chromatic aberration. ‘The inclusion of four aspherical lenses helps achieve the downsizing of the lens unit…’ adds the firm. 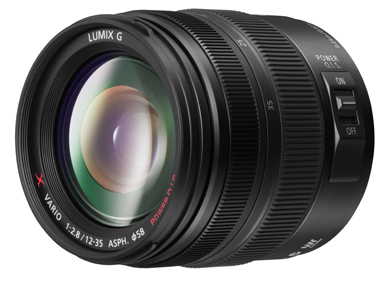 The 12-35mm is 73.8mm long and weighs around 305g, according to Panasonic. It contains a seven-blade aperture diaphragm. Panasonic revealed a mocked-up version of the new 12-35mm lens at the Consumer Electronics Show in Las Vegas in January.